It happens hundreds of time when we forget to log out our Gmail account at any public place. Millions of people use Gmail and all other related Google services daily. As everyone is not in a habit of using Gmail on their own devices, sometime they need to open their Gmail account at any public place. But the problem occurs when they forget to log out their account from that public place. So to help you with that I am going to provide you a brief description on how to log out your Gmail account all sessions remotely. If you're were using your Gmail account at any cyber cafe and forget to log out then it can be misused up to a large extent as you know that cyber cafe act as an public Internet provider. Daily hundreds of user login and logout there. Anyone can read your confidential mails which can cause inconvenience to you. But don't worry Gmail has 'remote log out' feature for all its users. You can log out all your active Gmail sessions remotely from any device either PC or Smartphone. 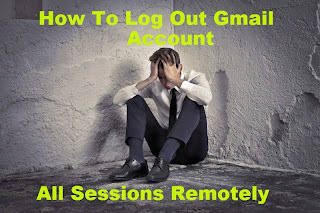 Below is a complete step by step process to log out your Gmail sessions remotely. First of all login into your Gmail account from your PC/Phone. Now scroll down to the bottom of the page, there you will see a option "Details" at the bottom right corner. There you can see all your active sessions. Simply click on "Sign out all other web sessions". This will log out all your active Gmail sessions. Your Gmail account will be logged out from each and every device, even you will be logged out from current device too. You will need to enter your details again to log in. So this was all about how to log out all your active gmail sessions remotely. This is an awesome feature from Gmail which can help you to secure your account in any case you forget to logout it at any public place. This feature is provided by Gmail only because of security issues. As most of people have confidential emails in their Gmail account. Facebook also provide this feature only because of security purpose. If you have any doubt or query then feel free to leave a comment below in the comment section.